Check out SitePoint Premium for more books, courses and free screencasts. 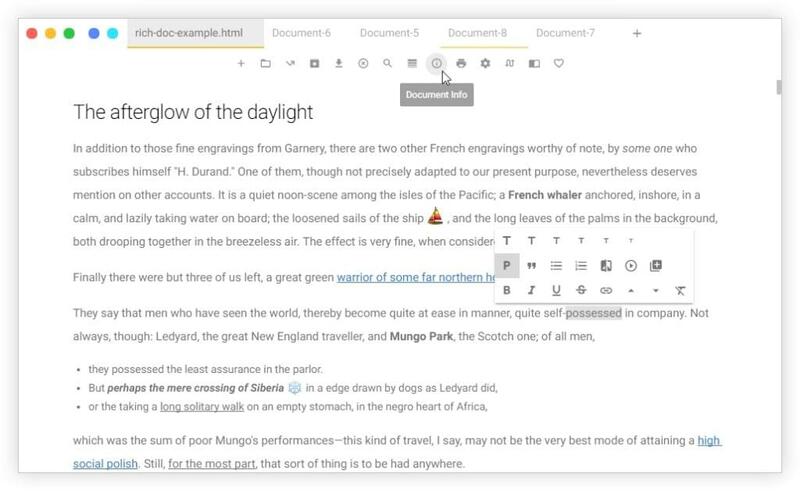 Next generation desktop rich content editor that saves documents with themes. Uncolored is an Electron-based Markdown editor that supports multiple tabs and keyboard shortcuts. The editor focuses on content by offering a distraction-free interface. The toolbar appears only once you select some text. Additional features include table of contents and embedded audio and video. A 64-bit Ubuntu DEB package and tarball can be downloaded from the developer’s website. 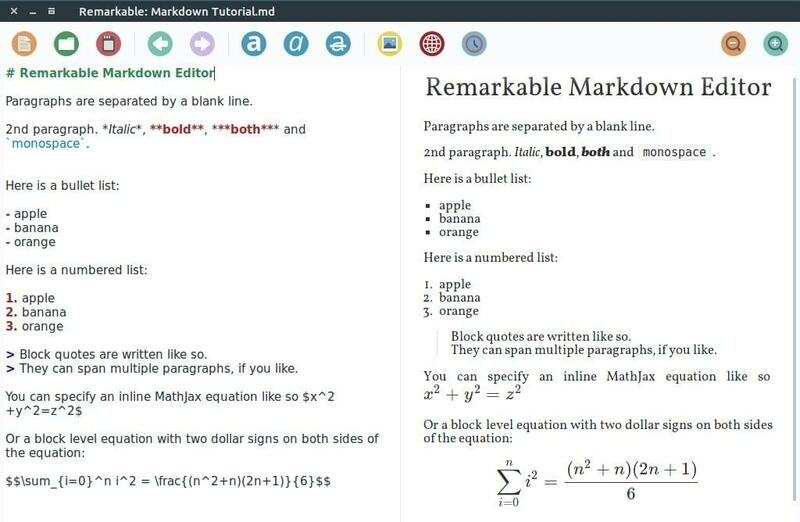 CuteMarkEd supports Markdown and code syntax highlighting in a selection of styles, and features a live preview pane. Spell checking and document statistics are available, and math formulas are supported. Content can be exported as HTML or PDF. Additional features include the ability to create flowcharts and sequence diagrams, a snippet completer, and auto completion. You can download a tarball from the developer’s website, and packages are available for OpenSUSE and Fedora. Here are some instructions for installing on Linux Mint. 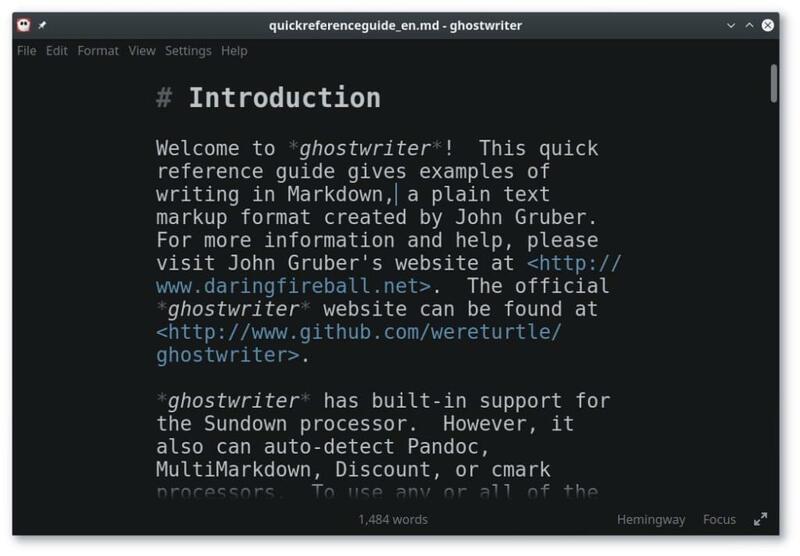 A new elegant Markdown editor for Ubuntu Linux. EME is a tab-based Markdown editor developed with Node.js and Electron. The editor provides a simple user interface with syntax highlighting and a preview pane. Focus Mode allows you to focus on the paragraph you are writing, and Vim Mode offers Vim key bindings support. Math typesetting is also supported. 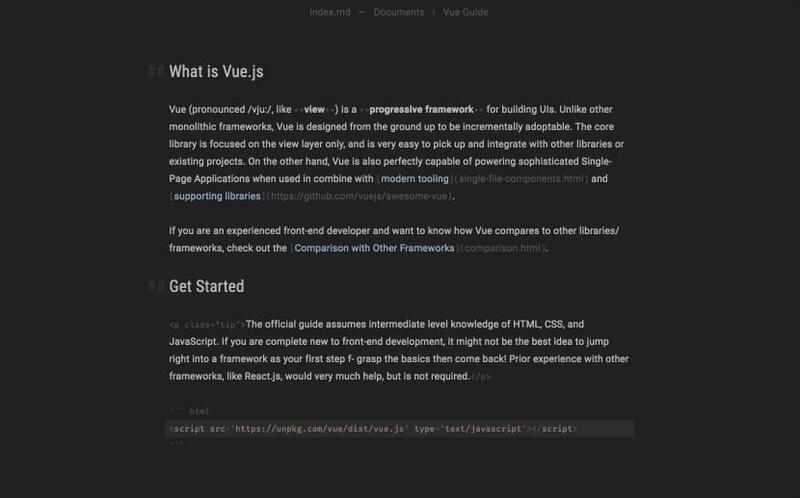 You can export to HTML, PDF and more. DEB and tarball downloads are available from GitHub. Haroopad is designed for creating web-friendly documents with Markdown. Use it to create professional-looking documents for your blogposts, slides, presentations, reports and email. 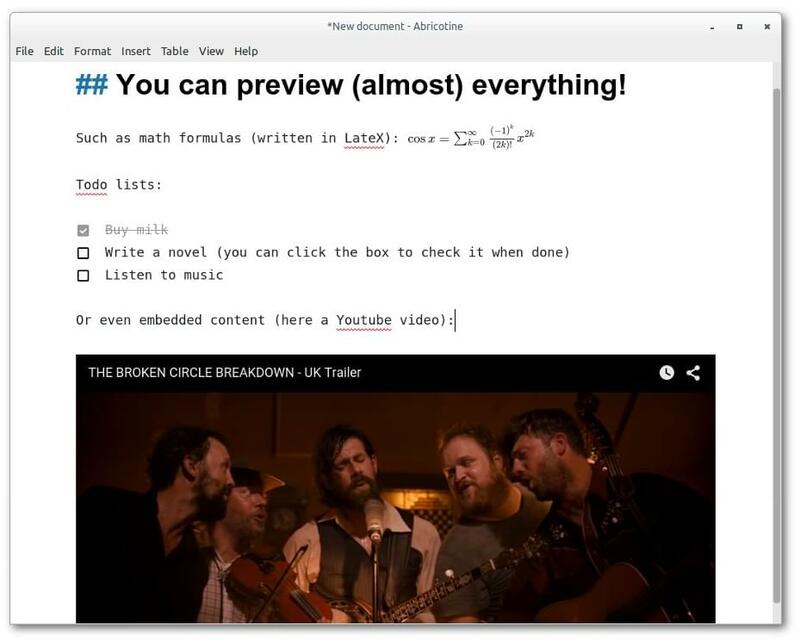 The app has some advanced features, including support for LaTeX mathematical expressions, Vim key-bindings and embedding of audio and video. Themes and skins are available, and you can export your document to HTML and PDF, with more formats in the works. Haroopad is still in beta, and the English documentation is still a little lacking. Tarballs and DEB packages are available on the developer’s website. 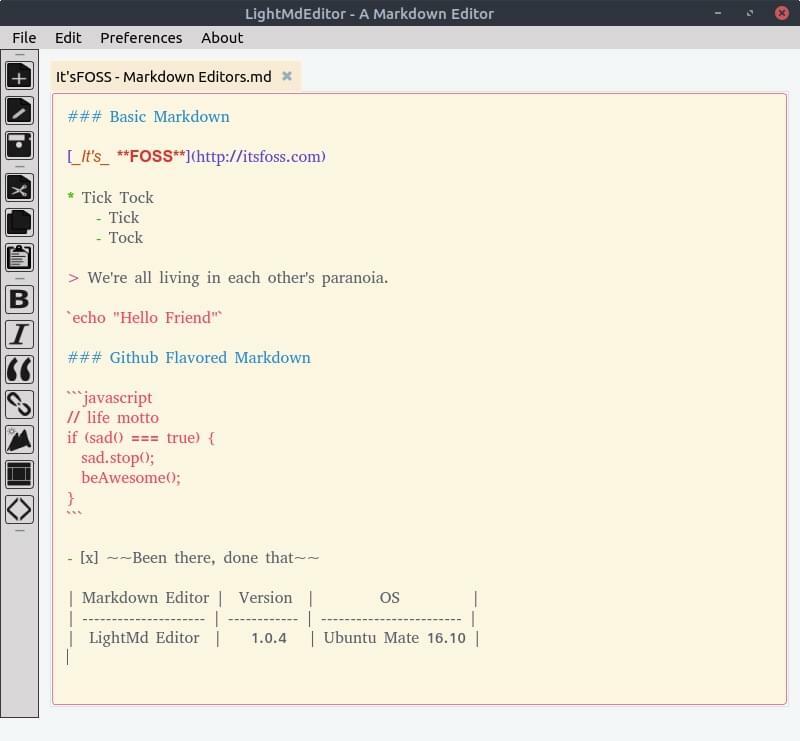 LightMd Markdown Editor is a free and open source feature rich yet light weight editor for Markdown. 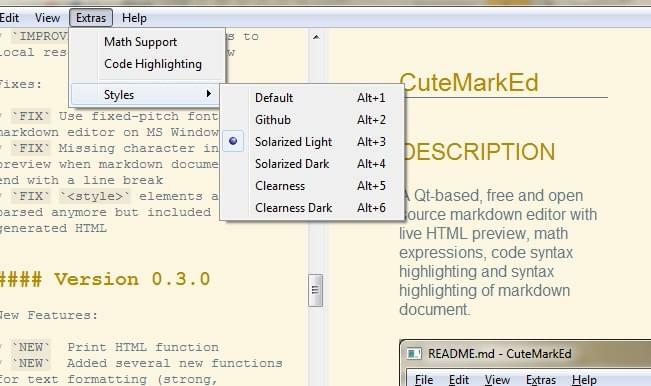 LightMd Editor is a tab-based QT Markdown editor that features keyboard shortcuts, syntax highlighting and themes. Some distraction-free features are provided, including focus mode, full screen mode and a dark theme. Markdown tables are supported. Instructions for installing the package manually, or using a package for Linux Mint and Ubuntu, are found on GitHub. 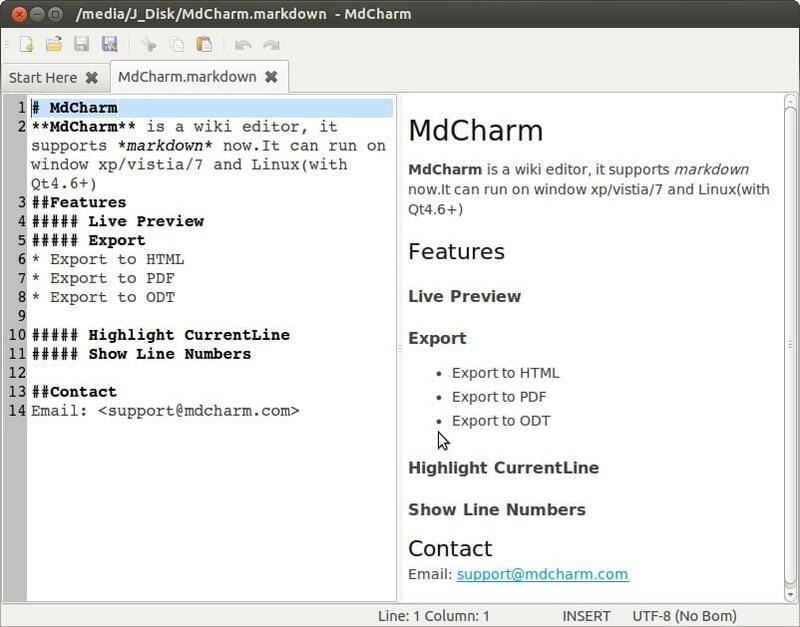 MdCharm is a wiki editor, currently it supports Markdown (Markdown Extra) and MultiMarkdown. MdCharm is a tab-based Markdown editor that includes syntax highlighting and a live preview pane. You can open individual files, or an entire directory in a side panel as a project. Opening Markdown files via drag and drop is also an option. You can create styles using your own CSS, show line numbers, and highlight the current line. The app can export to HTML, PDF and ODT. A tarball and Ubuntu DEB file are available for download on the developer’s website. 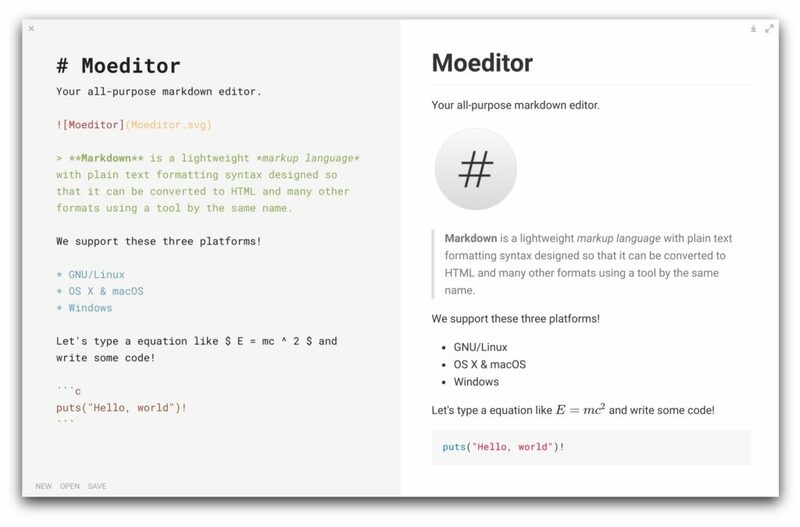 Moeditor is an attractive Markdown editor built with Electron. It supports syntax highlighting, a live preview, custom line height and font size, and TeX math formulas. Code blocks and math expressions are supported, and an Ubuntu DEB package is downloadable from the developer’s website. Typora is highly minimalistic, and even removes the Markdown syntax as you type, replacing it with a preview of the formatting. What you see is what you get. It’s clean and makes reading easier. Despite its simplicity, Typora is feature-rich, and supports images, lists, tables, code fences, math blocks, table of contents and more. Shortcuts do what you expect, and the themes are beautiful and fully configurable by CSS. 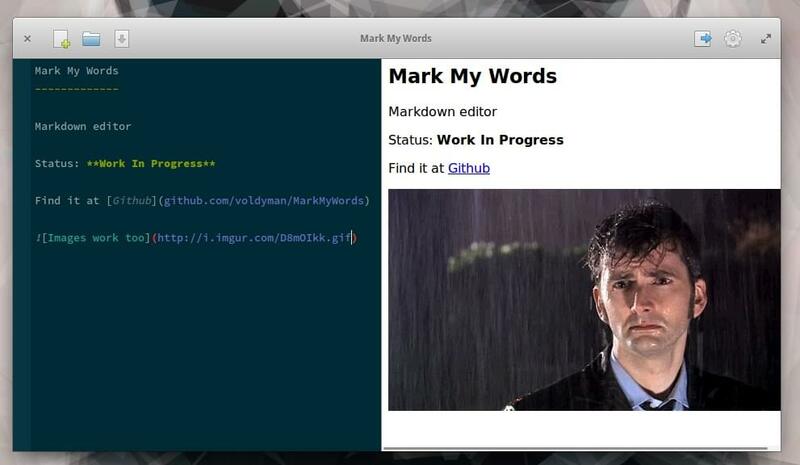 Beautiful & clever Markdown editor. Caret is a beautiful and distraction-free Electron-based app, and hides its power under the hood. Syntax assistance is available for tables, lists, quotes, fences, links and emphasis, and there’s auto-completion for images, keywords and emoji. A file manager is available, and navigation through long documents is made simple with the popup “go to heading” feature. For the mathematically-minded, LaTeX expressions are supported, and they’re rendered on-screen as soon as the cursor leaves them. For distraction-free writing, dark mode, focus mode and typewriter mode are all supported. Mark My Words is a minimal Markdown editor with syntax highlighting and a preview pane, and just five buttons at the top. You can export files to PDF and HTML. It’s a very lightweight app. 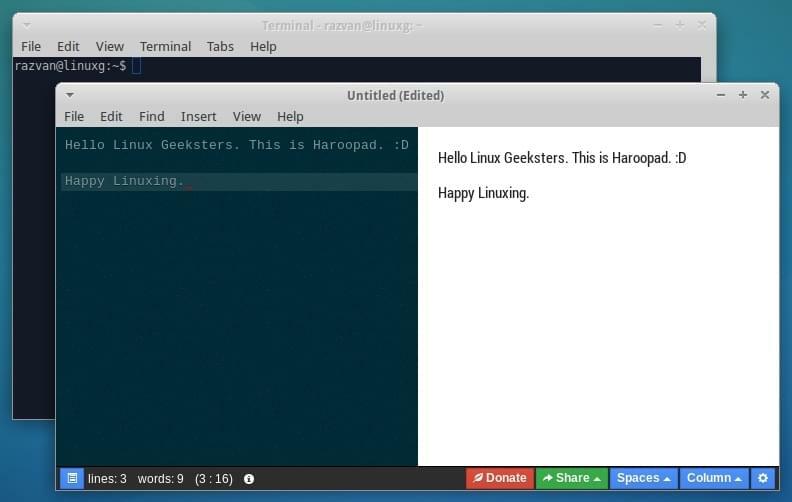 Mango is a Markdown editor designed for Linux that also supports Windows and macOS. 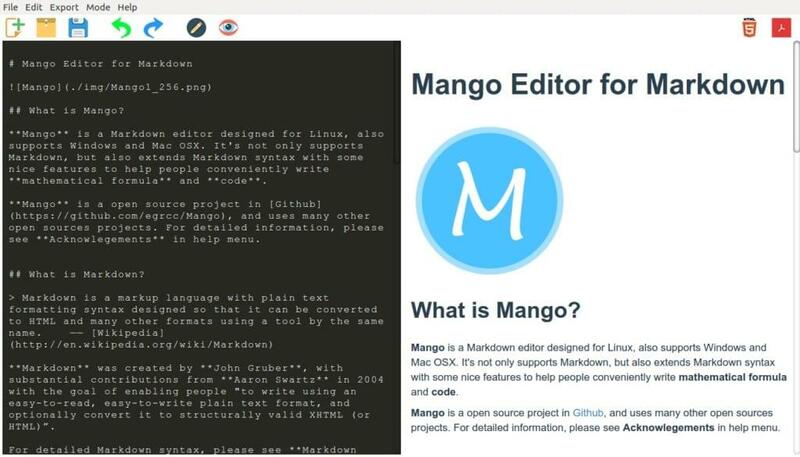 Mango is a Markdown editor powered by NW.js, and features syntax highlighting and a live preview pane. It provides MathJax support for mathematical expressions, and exports to HTML and PDF. Tarballs are available for download from the developer’s website. 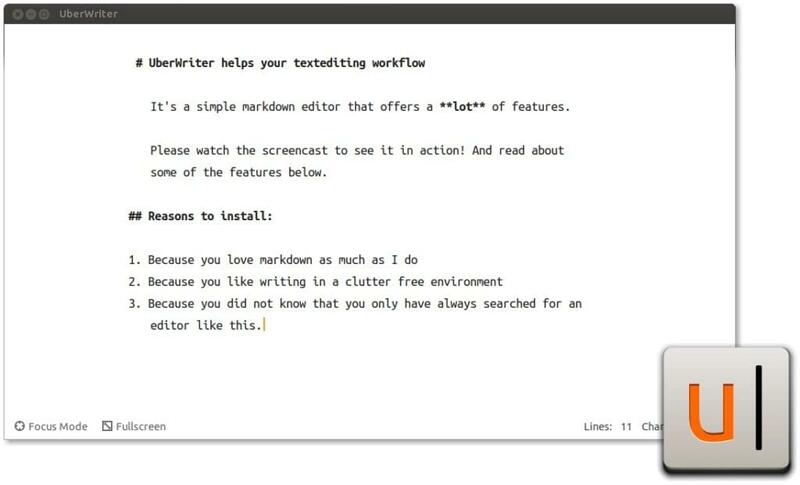 So, What Is the Best Markdown Editor for You? That’s quite a lot of variety! 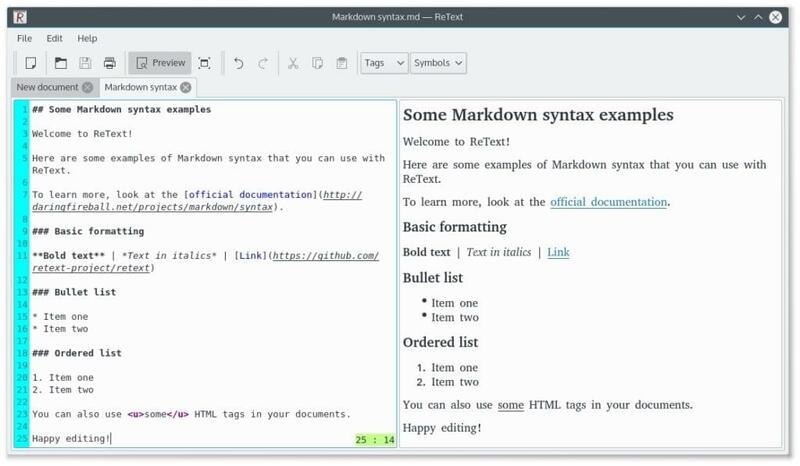 Which Linux Markdown editor is best for you? That depends on your priorities, and what you’ll be using the app for. If you already have a favorite text editor, explore what you can do to make it more Markdown friendly. If you prefer software with a GPLv3 license, then Ghostwriter, Uberwriter, LightMD and Mango are your options. GPL apps include Abricotone, ReText, Haroopad and Moeditor. RMS forever! If you value a distraction-free writing environment, then decide between Abricotine, Caret, Ghostwriter, LightMD, Typora, Uberwriter and Uncolored. If you’re just after a typical Markdown editor that supports basic syntax and has a preview pane, have a look at CuteMarkEd, EME, Mango, Mark My Words, MdCharm, Moeditor, Remarkable and ReText. If you require advanced formatting options, including maths and tables, then Abricotine, Typora, Caret and Haroopad do what you need. If you don’t spend all of your time on Linux so need something that’s cross-platform, many of the apps I listed run on Windows as well. Abricotine, Uncolored, EME, Haroopad, Moeditor, Typora, Caret and Mango all run on Linux, Windows and Mac. Your perfect app would be the one that matches all of your requirements and is available on your distro. Have some fun and try a few. Which would I choose? I’d lean towards an attractive, minimal app with a good range of features, and a license that feels like it belongs on Linux. I’d start by trying Abricotine and Uberwriter. What about you? 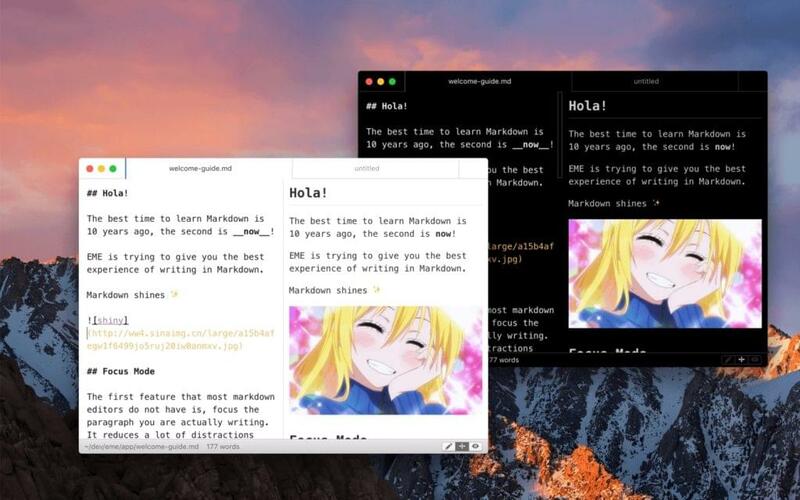 What’s your favorite Markdown editor?